Welcome to the Home Flooring Pros where today we’re looking at the national average hardwood refinishing costs based on the type of wood floor refinish you’re looking for. We will list out the cost per square foot for three different types of wood refinishing projects, as well as the factors that affect price. So for the cost to strip, sand and refinish hardwood flooring read on. The tables and content below give you an approximate estimated cost to refinish wood floors. For accurate prices tailored to your specific home please get yourself three to four free estimates from trusted local contractors. Even if you plan to refinish a hardwood floor yourself you might consider getting some quotes just to be sure that DIY really is the cost effective way to go. Screen and Recoat Floor $0.75-$1.50/sq. ft.
Polyurethane and applicator $1.15-$1.85/sq. ft. Many homeowners are unclear on the difference between screening and refinishing wood floors. Let’s define terms and discuss when each of the three approaches in appropriate. Professional cost to screen and coat hardwood flooring: $1.15-$2.25 per square foot. When to screen and coat hardwood: This method is ideal when only the polyurethane that protects the flooring has been marred but the underlying hardwood is in good condition. Pros recommend screening and coating the floor every 3-5 years or as needed to prevent damage to the hardwood and delay the need for refinishing. How to screen and coat hardwood: The room is cleared before being screened using a mechanical buffer (most common) or by hand. The floor is vacuumed and then tacked, the process of removing remaining fine dust particles using a damp microfiber cloth. Finally, one coat of polyurethane is applied. Refinishing hardwood flooring is the process of sanding away the damaged top layer of wood and applying a fresh finish. Professional cost to refinish hardwood flooring: $2.50-$5.50 per square foot. When to refinish hardwood: This method is necessary when scratches, dents and stains have damaged the wood, not just the polyurethane sealer. How to refinish hardwood: The polyurethane and enough of the wood is sanded away to remove light damage. If a wood plank is deeply scratched, it can be repaired with wood filler or the plank can be replaced. The bare wood floor is vacuumed and tacked. Two or three coats of polyurethane are applied. The first coat can be a combination stain and polyurethane product if you wish to change the hue of the wood. Combination products like oil-based Minwax PolyShades and water-based Cabot Polystain are a good choice. Wood floor stain is available in more colors than combination stain and polyurethane. Homeowners have the flooring stained separately when the color they want is only available as a stain. When to stain wood floors during refinishing: When the color you prefer is available only as a stain, not in a polyurethane product. Also, some professional hardwood refinishers prefer to apply stain separately rather than in a combination stain and polyurethane product. How to stain hardwood when refinishing: When the floor has been sanded, vacuumed and tacked, stain can be applied. When dry in 4-6 hours, a second coat of stain can be applied to darken the color, or the first coat of polyurethane can be applied. When you are unsure which technique your floor requires, discuss the options with a hardwood refinishing contractor. In fact, we recommend getting opinions and cost estimates from two or three refinishers. Be sure to let them know you’re aware of the screen and coat technique, or they might fail to present it as an option. The advantage of the screening and coating a floor are lower cost and fewer days your home is disrupted. In the long-run, the greatest advantage of the screen and coat method is that it doesn’t take years off the life of your floor, since none of the wood is removed. If screening the flooring doesn’t remove the scratches and stains, and the hardwood is recoated, you’ve wasted your money. This is easily avoided by evaluating the floor after screening. If the damage has been removed, the technique has succeeded, and you’ve saved money. A danger of DIY hardwood floor screening is not knowing how heavily to screen the floor. If the screening is too light, the damage won’t be removed. If it is too heavy, it might remove all the polyurethane in some areas. Staining or applying polyurethane to a floor that is part bare wood and part poly-coated will leave it looking mottled. Refinishing the floor ensures the most beautiful outcome. It removes scratches, stains and discoloration in the wood or old polyurethane finish. You also have the option of changing the color of the wood with stain. 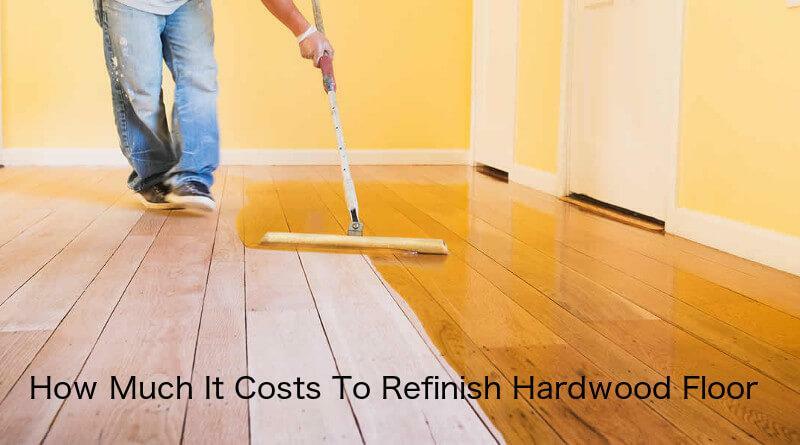 The disadvantages of refinishing wood floors are the higher cost and the fact hardwood can be refinished a limited number of times before replacing it is necessary – 3 to 5 times for solid hardwood, but just 1 or 2 times for engineered hardwood. The danger of DIY hardwood floor refinishing is the potential for doing severe damage to the floor with the sander. It’s a powerful tool that can easily gouge the wood or leave low spots through uneven sanding. The size of the job: The larger the job, the lower the cost per square foot. The floor plan: Refinishing 1,000 square feet of flooring in three small rooms, for example, takes a lot more preparation and labor than refinishing the same amount of hardwood in an open floor plan. Stains: Water and pet stains require extra work and care to remove. Local cost of living: Average costs are highest in major metropolitan areas on or near the Coasts. They’re lowest in rural areas of the Midwest and South. Costs vary by about 25% across the country. Lead paint abatement – painted flooring: $9-$16 per square foot. Can you refinish engineered hardwood? Find out.